Good evening, I am delighted to have been invited to give this talk by the Pembrokeshire Historical Society. It has been many moons since I last did so: if I recall this was on a winter’s night in Saint David’s some fifteen years ago. The subject of my talk then was the discovery of what was claimed to be a Roman villa at Ford near Wolfscastle by Richard Fenton in 1811, a site that I subsequently investigated in 2003. I also broadened that presentation to encompass other discoveries in Roman Pembrokeshire up to that time. Since 2003 I have been a bit distracted by work commitments in London and overseas, but have still retained a keen interest in the Roman history of this region and in light of the fact that discoveries continue to be made, I felt that the time was ripe to revisit to take a look once more at the broader picture as it now stands. To put these more recent discoveries into their rightful place, I think it is necessary to turn the clock back to the first suggested evidence for the Romans in Pembrokeshire and present something of a chronological overview. This will encompass the discovery of Roman villas, military and civilian sites, and Roman roads through Pembrokeshire. I should stress at this early stage that the work of Dyfed Archaeological Trust and The Royal Commission on Ancient and Historical Monuments has been instrumental in our increasing understanding of this situation. Also, the work of Martin Davies in recent years has tackled the investigation of Roman roads in Pembrokeshire and Ceredigion head on and I will return to Martin’s work later. Perhaps the most appropriate place to begin in our grand tour of Roman Pembrokeshire is in the Roman period itself. The first evidence comes from Book Two of Ptolemy’s Geography, produced in the second century AD. This mentions Saint David’s Head by the name Octapitarum Promontorium Slide 1. This is thought perhaps to refer to the Bishops and Clerks islets west of Ramsey Island. The map also mentions Moridunum (Carmarthen), along with the Demetae, the Celtic tribe who inhabited this region in the Iron Age, who evidence suggests were thoroughly Romanised, Moridunum being their political centre before and during the Roman period. Moridunum is also mentioned in an itinerary known as The Peutinger Table, thought to be a thirteenth century copy of a Roman original of the third century AD. Acquired by the German antiquarian Konrad Peutinger in 1508 and now in the Hofbibliothek in Vienna. Slide 2. Other ancient references to place-names in the county come from a forged fourteenth century document, History and Itinerary, written by Richard of Cirencester. Slides 3-4. 1809 translation. This includes an itinerary of Roman Britain, listing a road known as the Via Julia west of Moridunum (Carmarthen) to Ad Menapiam (St David’s), via Ad Vigesimum (a supposed Roman station located in north Pembrokeshire. The authenticity of this document was widely accepted when it was first published in 1757 by Charles Bertram, but proved a forgery by Bernard Woodward, Librarian in Ordinary to Queen Victoria in 1847. Richard of Cirencester was actually a fourteenth century monk and historian at Westminster Abbey. At Castle Flemish, the Antiquarian Richard Fenton found fragments of Roman brick here, as he describes in A Historical Tour Through Pembrokeshire. Slide 5. It was excavated by Mortimer Wheeler in 1921, he discovered sherds of Roman pottery, hexagonal roofing slates, and flue-tile. The site is now identified as an enclosed Roman villa. Slides 6-9. Another account of a Roman villa at Ford near Wolfscastle was published by Fenton in the same book. This is an oft-cited quote but the essence of it is the discovery of a bath, roofing tiles with iron nails, various bricks, some grooved, and others etched with lines. However, subsequent investigations at the site of Richard Fenton’s Roman villa at Ford continued to recover Roman material through the course of the twentieth century, such as roofing slates and a Roman oil lamp, which is presently in Carmarthenshire Museum. It should also be stressed that Roman material has been recovered from a range of sites in the north and south of the county, notably from coastal promontory forts at Brawdy, Buckspool, and elsewhere, furnishing evidence of steady occupation through the Roman period. The same may be said of a series of so-called ‘ringforts’ near Llawhaden and elsewhere. Also, there have been numerous Roman coin hoards discovered in the county and the broader region. After Fenton’s identification of the Ford Roman villa, the next site of its kind was not discovered until 1950. This is at Trelissey near Amroth in the south-east of the county, and it was excavated under the direction of W.G. Thomas and R.S. Walker in 1950 and 1951. Slides. 10-12 They found a formal Roman building with coarse and fine pottery, the head of a javelin, and other finds. It is generally agreed that the site is an enclosed Roman villa. In 1995, a Roman road was excavated during the construction of the Whitland bypass just over the border in Carmarthenshire. Slides 13-14. This is a section of a road known from aerial photographs heading west from Carmarthen into Pembrokeshire, traced as far west as Wiston. The next tangible Roman discovery, or should I say rediscovery, occurred on the site of the Ford Roman villa observed by Fenton. In early 2003, guided by an Ordnance Survey map, I visited the site and found several large roofing slates. Subsequently, I undertook a geophysical survey with Tony Johnson of Oxford Archaeotechnics and we found a rectilinear building on a SE-NW alignment under the intersection of three hedges. Slides 15-20. As expected, the ferrous material in this general location (fences, gates, water trough) had washed the signal out over this area, but it was still possible to identify the general form of a subterranean feature approximately 18.5 by 7.5m. The original excavation at Ford took place with the kind assistance of several local volunteers on the weekend of 29 and 30 March. It was logical to excavate the area that corresponded to the clearer part of the geophysical plot, south-east of the water trough. This entailed the investigation of an area on a N-S alignment, carefully removing the overburden to reveal a series of large stone slabs. These were essentially the foundation stones of the building and there was no trace of any of the superstructure apart from an area of tumble, which did not appear to correspond with the alignment of the structure. Overall, the site appears to have been heavily robbed of stone, a process that was underway between the building’s discovery and Fenton’s visit. Disappointingly, there was a distinct lack of pottery apart from a piece of Roman fabric that is a tile or brick. However, a grinding stone or quern was unearthed. This appears to be part of a saddle quern, which consists of a lower stone (saddle stone) on which corn was placed, and an upper stone (rider), which was pushed to-and-fro on top of this. Normally these were replaced in the Iron Age by the beehive rotary quern but in some areas, saddle querns remained in use into the Roman period. Several more roofing slates were discovered. Without question, the most diagnostic find was a piece of flue tile, with a distinct combing pattern, reminiscent of Fenton’s description of similar material over two hundred years ago. The tenant farmer of Bank Farm had kindly agreed to fence this area off to prevent cattle straying on to the excavated area, but he was unable to sink any stakes at a sufficient depth due to the presence of subterranean stones. Without doubt the base of the building continues on a south-east alignment and extends beyond the present farm track, so there is certainly scope for future excavation in this location. In 2010, the site was surveyed and excavated by Dyfed Archaeological Trust with the assistance of local volunteers under the direction of Duncan Schlee but investigation was hampered by the presence of a farm track which now overlies much of the area originally investigated. Slide. 21. The geophysics echoed the results of our survey but with the exclusion of the villa building, but the coverage was more comprehensive, and revealed the presence of a previously unknown prehistoric enclosure as well as a possible Romano-British building to the north-east of this site. Since this survey and excavation were undertaken, further Roman discoveries have been made. One of the most significant of these is a Roman fort at Wiston. This was found in 2012 through geophysical survey, followed by trial excavation (in 2013 and 2014) by James Meek of Dyfed Archaeological Trust. Slides 22-24. Part of this has been visible for some years on Ordnance Survey maps but it had been previously dismissed as recent. 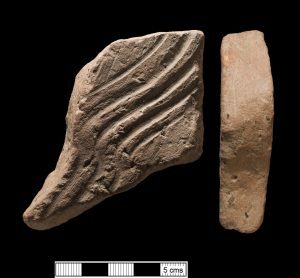 Examination of the pottery suggests that the fort was occupied in the late first century/early second century AD and that it was reused in the mid-second to the mid-third century AD, perhaps as a civil site. A significant breakthrough was made when geophysical surveys revealed the presence of an extensive civilian vicus settlement to the south. This was confirmed by excavation in 2014. It is important to say a little about the identity of the people who would have inhabited civilian villas on the one hand; and military forts, on the other. Evidence elsewhere in Britain indicates that the owners of what we term Roman villas were not in fact Roman but were essentially elites who were local to individual regions and bought into the Roman brand. Forts on the other hand were garrisoned by Roman legionary troops and auxiliaries from across the Roman empire. The Wiston fort was probably built by legionariess and auxiliaries of the Second Augustan Legion whose headquarters were at Caerleon near Newport. Slides 25-26. It is known that units from the legion were involved in the construction of Hadrian’s Wall in the second quarter of the second century. This extraordinary development is by no means the end of the story of new Roman discoveries in Pembrokeshire. In February 2017, I received an email out of the blue from a student named Luke Hooper at Bournemouth University. He asked my opinion of a geophysical plot of a survey that he had undertaken in the summer of 2016 in north Pembrokeshire, under the auspices of University College London. Conclusion: an enclosed villa with a square Romano-Celtic temple adjacent to it. Slides 27-28. A small excavation of this site was undertaken last summer and this confirmed that the site is a Roman villa. One of the major contributions to the study of Roman Pembrokeshire in the county most recently has been presented by the work of Martin Davies. Martin has been investigating the elusive Roman road network in the county and also in Ceredigion as published in his new book, Ancient Causeways Uncovered. Slides 29-34. Of special interest is a route that appears to run north from near the Roman fort and vicus at Wiston, over the Preselis via Tafarn-y-Bwlch and into Ceredigion. Slides X-X. Llandewi Aberath. Road heading north. Part of his suggested route runs straight past the Roman villa and temple site just mentioned. A Roman road that is of particular interest to Martin, myself, and others, is the route mentioned earlier, that runs from Carmarthen to Wiston. The intriguing question is: where is it heading? An obvious place is to the Cleddau here in Haverfordwest, however, to the best of my knowledge, there is no evidence of this as yet. It is often thought that the road is heading to Saint David’s, and there are some clues given by particular place-names, but there is also some possible archaeological evidence. At Rudbaxton, a possible trace of a Roman road was observed by aerial photography on WSW-ENE bearing by Chris Musson of The Royal Commission on the Ancient and Historical Monuments of Wales, in 2002. The next clue is a long stretch of road known as The Causeway which lies to the north of Camrose and tracks in a general north-westerly direction. Slides 35-37. This is not marked on the modern 1:25,000 Ordnance Survey map of north Pembrokeshire, but it appears on older OS Maps, as in the case of this map, published in 1951. It is highly probable that this was the route taken by Gerald of Wales in the later twelfth century. Slide 38. In The Itinerary of Archbishop Baldwin Through Wales: ‘From Haverford we proceed on our journey to Menevia [Saint David’s]… and passed through Camros… We then passed over Niwegal sands…’ (Gerald of Wales, Book I, Chapter 13). Fenton considered that Brawdy, on the hill to the north, could derive from Broadway, but this idea is perhaps not plausible in light of the fact that it may in fact derive from the Welsh name Breudeth. In a manuscript of 1293, Breudeth had been shortened to Bre’udy according to Bertie George Charles (The Place Names of Pembrokeshire, 1992). There is possible archaeological evidence for a Roman road a little to the south of Brawdy at Llethr, which was photographed by Toby Driver in 2003, and this may be a northern extension of the road described by Fenton. Roman roads are marked on the older Ordnance Survey maps between Brawdy and Saint David’s but these appear to be influenced, perhaps in large measure, by the forged map of Charles Bertram. For instance, Menapia Roman Station is marked above Whitesands Bay. Slide 39. It is curious that this is also known as Porth Mawr – Great Port. Also, this was an important medieval crossing point to and from Ireland. I am grateful to Bishop Wyn Evans for clarifying this point. Crucially, Pliny the Elder, Natural History, writing in the first century AD, mentions that: ‘Hibernia lies beyond Britannia, the shortest crossing being from the lands of the Silures, a distance of 30 miles’ (Book IV.16.103). (45.6 kilometres or 28.33 miles). The distance in fact is about 47 miles. The importance of Whitesands Bay as a point of crossing to Ireland is underscored by the excavation in 2016 by Dyfed Archaeological Trust of around 50 skeletons at Saint Patrick’s Chapel, dating to the early medieval period (seventh to eleventh century). Slide 40. There is no certain archaeological evidence for a Roman presence apart from an unconfirmed fort at Trepewet east of Saint David’s. However, I think there are reasonable grounds to assume that a road runs from Saint David’s east to Carmarthen. Place-names and archaeological evidence play a role here. We pick up the chase again near Brawdy, with reference to ‘Broadway’. Slide 41. This photograph of a parchmark was taken by Toby Driver near another Broadway, located to the west of Llawhaden in 2003. This is the Carmarthen to Wiston Roman road mentioned before. I think that it is significant that just a few kilometres to the east of Broadway, near Brawdy, is another Broadway, taken by Toby Driver in 2006. Slide 42. This lies not far to the southwest of the Ford villa near Wolfscastle. A large section of hedge/trackway runs in a general ENE direction for some distance. Slides 43-44. This takes a line to the south of the modern road alignment that is marked on the older Ordnance Survey maps as Roman. The same may be true further to the east near the Roman villa site at Castle Flemish. On the OS map the road bisects the site and this is probably because it was thought of originally as a Roman station. Slides 45-47. It is in fact plausible to think that a Roman road runs further to the south, since there is a place-name a little to the southwest of the site called Stradland, which may be interpreted as ‘Streetland’, referring to the presence of a Roman road. Generally speaking, from my experience in other parts of Britain, Roman villas tend to logically correspond to Roman roads. You don’t get one without another. Akeman Street. Slides 48-51. There is every reason to suppose from place-names that the road continues east, crossing Martin’s north-south road through the county somewhere near LIys-Y-Fran bisecting it near Springhill House. The next relevant place-name, Pensarn, is about seven kilometres to the ESE, on the western bank of the Eastern Cleddau River. Approximately three kilometres to the north-east appear the names Parcsarnau and Sarnau. It is often the case that some crucial names have been removed from the modern Ordnance Survey maps, such as Parcsarnau in this case. Slide 52. The next place-name, Pen-sarn, comes east of Login. Slide 53. Then ESE of Llanboidy there is a veritable cluster of relevant place-names: Blaen-sarn-goch, Sarn-goch, Sarn-newydd, Caerlleon, Efail-Caerlleon, Penyrheol, Sarnau, Sarn-y-bwla. Slides 54-56. The route comes to an end west of Carmarthen where it may intersect the Roman road to Whitland and beyond. I am not the first person to note this concentration of place-names. In fact Professor Barri Jones did so in 1971 and also identified an agger running on a general east-west alignment towards the confluence of the Afon Cywyn and the Nant Cynnen near Rickett’s Mill in the direction of St David’s Hospital. Slide 57. The most extraordinary thing is that the collective evidence, from archaeology and place-names, appears to confirm the existence of a roman road that more or less follows the fictitious Via Julia. Slide 58. I should conclude by reflecting on future discoveries, and I am convinced that there are many more villas that await investigation, with perhaps fewer forts to be established along the emerging Roman road network. It is not difficult to envisage the presence of a Roman road linking the Cwmbrwyn villa near Llandorow, discovered in the early twentieth century, with the Trelissey site at Amroth. Slides 59-60. especially since there is every reason to suspect another site nearby at Eastlake Farm. In the meantime, the forthcoming excavation of the Roman villa discovered by University College London in north Pembrokeshire may even produce the long-awaited discovery of some Roman mosaics. Such is the unpredictability and excitement of archaeology.